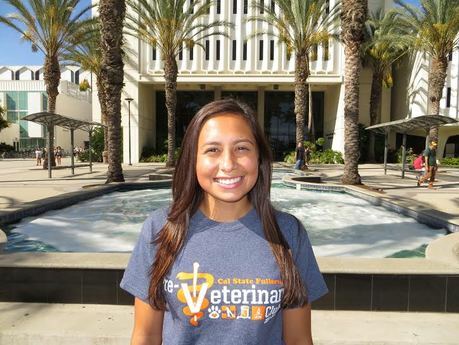 As Vice-President, she assists Arturo with all ongoing club activities which cater to those who are interested in animals or has a desire to pursue a career in veterinary medicine. She majors in Health Science as well as minoring in Pre-Health Professions. She has worked with the Great American Petting Zoo in running their events at the OC Fair with livestock. She had also volunteered at Rancho Los Lomas, attending to the different exotic animals as well as cleaning their enclosures. In the summer of 2014, she had been accepted to conduct research at UCI where she collaborated with other students while studying melanoma. During her spare time, she enjoys watching The Big Bang Theory and getting together with her friends. Her responsibilities include keeping track of the clubs finances. On her spare time she enjoys studying, reading, or watching Star Wars. 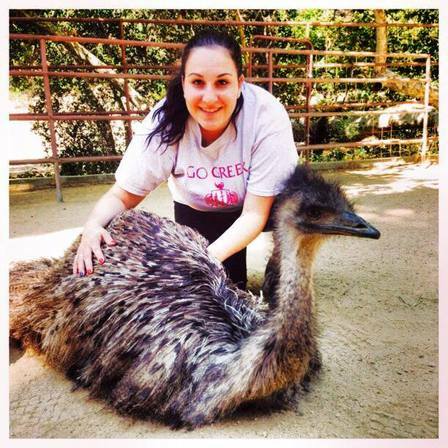 She is very involved with school and on her spare time she volunteers at Yorba Regional Animal Hospital, as well as, gaining experience with exotic animals at Rancho Las Lomas. Once she completes vet school she would love to work with exotics and eventually work at a wildlife sanctuary or possible open up her very own sanctuary. When life becomes overwhelming she likes to escape into the wild and reconnect with nature. She goes camping, hiking, and traveling, while seeing new things and meeting new people. Her mother always told her "that a friend is a stranger you just haven’t met yet", so don’t be a stranger and come check out the amazing club! As Secretary, she records every meetings and events as well as assist in the logistics of the club. She is majoring in Biological Science at CSUF. Since a young age she had been very sure of her dream of helping animals and owners alike. She has not decided what she would like to specialize in, but she is interested in working with small animals and exotics. Her career aspirations are to work as a veterinarian in a hospital or a zoo. She hopes to open up her own hospital one day. 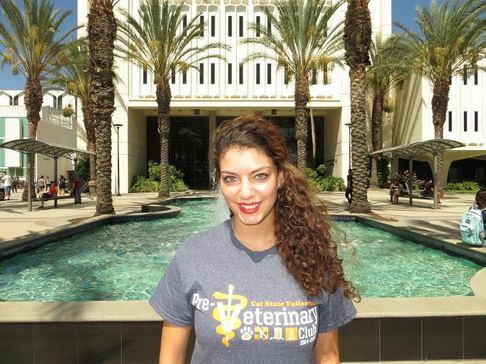 She volunteers at Yorba Regional Animal Hospital and Rancho Las Lomas. As a part time, she worked with the Great American Petting Zoo during the OC Fair. When she is not busy with school or working with animals, she enjoys being outdoors, preferably hiking or exploring the city. Her duties as one of the Social Chairs consist of organizing events for students to enjoy and gaining experience from. She is majoring in Biological Science and will be graduating with the 2017 class. Her experiences ranges with a variety of animals through volunteering at shelters and pet clinics. Along with her animal related experiences, she also has experience in other fields such as at a chiropractic office and volunteering at a library to tutor students with special needs. On campus, she likes to keep busy and stay involved by being a part of other clubs including the Biology club, Iranian club, and SHPA. Her hobbies include outdoor activities and running. He is also one of the Social Chairs in charge of organizing the exciting events that the club has to offer. He helps to further students' interest in the veterinary field and to ensure they are on the right track. At CSUF, he majored in Biological Science with a concentration of Cellular and Developmental Biology as well as a minor in Chemistry. 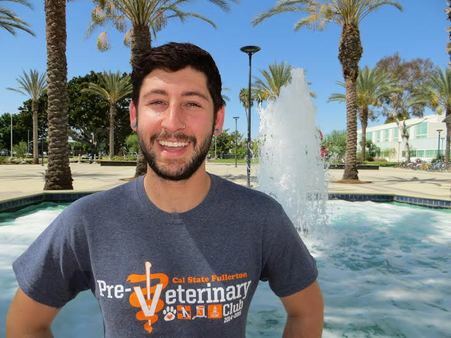 He has volunteered at a veterinary clinic for over 3 years, as well as volunteering with the German Shepard Rescue of Orange County. He had also worked at a pet resort along with a doggy daycare facility. He has a strong interest in zoological medicine. He also helped at a group home for intellectually challenged men, which has broadened his experience from animals to also humans. Some of his personal hobbies consist of hiking, attending concerts, and cooking. Her duties include keeping the club website updated with information in regards to the club meetings and activities. She also provides reliable resources to students who are interested in pursuing a career in veterinarian medicine. She is majoring in Biological Science at CSUF. She volunteers at Yorba Regional Animal Hospital and had been there for about a year. She is unsure of what area in the field she wants to specialize in because her knowledge and experience is still at its prime. Her ultimate career goal is to become a Veterinarian in dealing with small animals or marine animals and owning her own private practice with a connected building where there will be a shelter to provide help to the animals in need. On her free time she loves to spend time with her family and friends, as well as play soccer and volleyball. She also enjoys the outdoors and visiting new places. Her duties were to attend ICC meetings every week to discuss how the CSUF clubs are getting involved weekly and present events where the club can get financial funding for awesome activities and conferences. She was a transfer student majoring in Psychology. Her passion is to pursue a small animal practice, hence, why she is working at a small practice . She loves to go on adventures, however, when she is home she enjoys learning to play the guitar.